Holding your book and keeping it dry can be tricky. Many of us like to take a nice, relaxing, hot bath at the end of a long day. A glass of wine, a good book, or even music from our smart phone can really make the experience all the more relaxing and soothing. However, there is danger in trusting that your wine glass or device will be safe perched on the edge of the tub. Nothing makes a relaxing experience, well, stressful, like dropping a book or device into your bath water! Bathtub trays are a great solution for this. Whether you prefer classic wooden bathtub trays or more modern looks, bathtub caddy trays for reading, playing music and perching your drink on help ensure your bath remains relaxing and stress-free. While they all kind of look the same, if you read more carefully when reviewing bathtub trays, you might want to keep the following in mind when comparing your options. It is water-resistant and does not swell, shrink or warp when exposed to moist conditions. Having said that, it is not waterproof, so it’s best to wipe it down afterwards and not let it sit in water. It won’t rust, obviously. Finally, bamboo is known for being a very sustainable material, being fast-growing not needing fertilizers and self-generating from it’s own roots. Most bathtub trays are adjustable and can fit any bathtub size. If for any reason they have a fixed size though, make sure it’s right for your bathtub. What do you want to use the tray for? Bathtub trays generally look the same but if you look closer at what types of holders it has you will start to see the differences. Will you be using the tray to hold books? Drinks? Devices? Glasses? What kind of glasses? Some trays are slotted (typically the stainless steel ones) and some have a solid bottom. You want to ensure that you choose a style that can safely and stably hold the desired items without fear of them falling into your bath. If you want to watch your ipad does it have something to hold it up? What if you want to read a book, not only does it hold up the book, can it also hold the page? Some bathtub trays come with pegs which are useful for holding things in place. This bath tub tray uses pegs to hold a book in place. What can you use your bathtub tray for? Wine glass or other types of glasses – wine glasses are easy to tip over so is it secure? As you can see there’s all kinds of things you can use it for, but maybe less is more when you’re trying to relax. This is a high quality, affordable bamboo bathtub tray that features adjustable slots that allow you to safely and securely hold your favorite items while you enjoy a nice bath. It features a cloth back that can be used to prop up a book or even a smart phone or tablet. It is made from environmentally-friendly organic bamboo, giving you the peace of mind that you made a sustainable purchase. 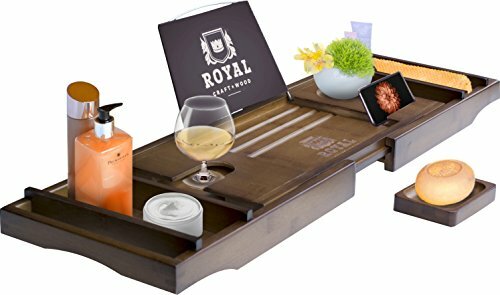 The Royal Craft bathtub tray is made from sturdy, durable, and environmentally-friendly bamboo wood. It is adjustable, making it the perfect tray for a variety of devices of all different shapes and sizes. It allows you to easily have a drink and a device safely installed while in the tub really amplifying your experience. This bathtub tray is made of bamboo wood which is known to be stronger than steel and more durable than oak. This bathtub tray is another excellent option if you are looking for a bathtub tray that can easily be adjusted and that is suitable for use with a range of different things, from drinks to tablets, to books. The tray provides a safe and secure holding mechanism by which you can easily read, watch, and play while you enjoy a soak in the tub. This is another great bathtub tray that has a few more features than some of the ones we have described above. The Luxe tray comes with a drink holder that can easily hold a wineglass, tumbler, or even a small bottle of soda. It has multiple grooves that allow you to have your book or device in the perfect angle and position for your needs. This bathtub tray is quite a bit different from the other models we have reviewed. With this tray, you actually get a folding tray that covers a good length of the bathtub. This allows you to keep your water warmer for longer, yet the tray does not get hot in the process. You have more space to place things on although there are specific no specific ‘holders’. Because these aren’t adjustable, they come in different sizes – 27.5 x 43 inch, 30 x 29 inch, 30 x 43 inch. This bathtub tray is the only one on this list made of stainless steel. It is made of food grade 304 Stainless Steel so does not rust. It has removable and adjustable holders that can hold your tablet,magazine,or book. It’s useful to have removable racks in case you don’t need them at times. It also has wine glass holder which holds the glass in the bowl part of the glass which is very secure. The ends of this tray have a grip with a white rubber coat which protects the tub. This tray is Expandable Up to 36 inches in width but fits best with bathtubs less than 33.3 inches. Bathtub trays are great. They are pretty cheap and if you take regular baths they really make things a lot easier and add a bit of luxury to the experience. And if you’re clumsy like me, it helps keep things simple and relaxed by removing the hassle of figuring out where to put (or balance) your stuff. They are also really great as a gift! Oh and by the way, if you’re a DIY king or queen, you can even try building your own bathtub tray!